One of the most famous paintings of surrealist painter Salvador Dali is called Persistence of Memory. 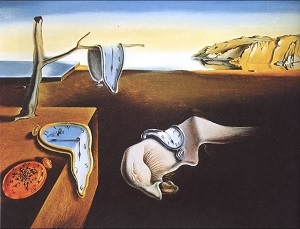 In this painting Dali has shown melting clocks with all of them showing the same time. This was probably Dali’s interpretation of Einstein’s theory of relativity where the space-time continuum is shown to be interlinked - space is flowing and time stands still. It is as if the memory of time got fixed in the painting. Memories persist whether they are in human brain or in matter or in space (the movement of planets) and require energy and active intervention to change or remove them. Memory can therefore be defined as an arrangement. Whether it is of numbers 0 or 1 (as in computing); atoms/molecules in a material or neural pathways in human brain or in the brains of other life forms. When the arrangement is changed by any means or an external force memory is transformed. The building blocks of memory however, just like mass and energy are never destroyed. Only the arrangement changes. We still do not know where the memory is stored in the human brain. Scientists have identified engrams (basically small neural circuits) which are signposts for the memory of certain object. However, the exact location of the memory of an object in the brain has remained a mystery and for an abstract thought, it is even a bigger mystery. For mundane or shallow memory the arrangement changes quite easily and regularly. This helps us in forgetting the day-to-day events and removes the clutter from our brain. However deep thought, which can produce very powerful memory, can reside in knowledge space (KS) and can be there for a long time leading to the persistence of memory! Deep thought is produced via Sanyam (combination of focus and meditation) on a single idea for a long time. This helps in producing a memory, which may reside outside the brain and in higher dimensional space called Knowledge Space (KS). Sage Patanjali calls such memories as Sanskaras. also possible that as earth moves around the sun and the solar system revolves around the center of the Milky Way galaxy, periodically we come across KS, which helps mankind to evolve. Similarly a younger civilization than ours may come across KS developed by us and thus the evolution continues. Human brain also has a memory of body map. This body map, which is an outcome of whole life’s worth of memories and experiences, produces very deep impressions on the mind and could be the basis of the “memory of form”. At the time of death it is the shedding of this body map or memory of form, which is painful. Thus it is the continuation of memory of form which makes us fearful of death and gives us the instinct of survival. This instinct exists in all life forms and could be the basis of procreation and proliferation of species. Advanced yogis have used the technique of raising kundalini, which somehow allows to shed the memories of the body and thus make death a less painful experience. Yogis claim that the memory of form persists for some time after death. This could be the basis of Thervi (thirteen day after death) ritual. However, this memory can persist for very long time after violent physical death and could give rise to ghosts, ghouls, etc. This happens since the body and brain do not get enough time to dissolve the memories. I feel that it is this persistence of memory, which also gives rise to the theory of Karma since the strong memories in KS decide and guide one’s life in subsequent births. These memories in KS may also bring people and other life together, via reincarnations, through ages because of past connections. The old adage “Janma janma ka saath” probably could be an outcome of such a process. With each birth the memories and connections either become stronger or weaken thereby changing the dynamics of bonds and relationships. For making and breaking long held memories either in the brain or in KS a powerful mind is required. It is only possible through a huge human brain and thus getting a human body is a cause of celebration and the best thing to happen for a living being on this planet earth and in the present evolutionary time-scale. It is quite possible that in future we may evolve into entities, which may be able to change dimensions of space and be able to change the memories in KS much more easily than presently possible. The whole basis of Yoga is to dissolve these memories either in the present brain or in the KS so that one can get out of the cycle of birth and death. Then the persistence of memory vanishes.